In a previous post, I directed those interested in buying an edition of Jane Eyre to a post at another blog. The same blog also has a review of hard cover editions of JE, which can be found here. And just a reminder, Jane Eyre the Musical is soon to open at Abilene Christian University, Abilene, Texas. This sweeping story of love and suspense, with universal and timeless themes, is a musical feast your heart will never forget. 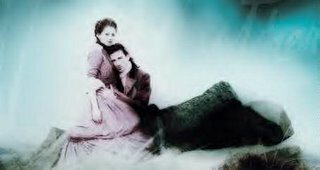 Faithful to the cherished novel, Jane Eyre is thrilling from the start to the tearful, triumphant ending. A recent Broadway favorite, the musical features songs such as "Forgiveness," "In the Light of the Virgin Morning" and "Brave Enough for Love." Don't miss this inspiring family treat. emily bronte is a perfect little "spinster"
Looking for a New Copy of Jane Eyre? I know that you all have a copy of Jane Eyre already, right, but you can never have too many editions. Or maybe you don't have a copy after all, and don't know which one is right for you. This post is just what you need to sort out the difficulty. Four editions of Jane Eyre are examined from the type face and paper texture down to the critical goodies. The editions are the Norton Critical Edition, Penguin, Oxford World Classics, and Modern Library. I do agree with her conclusion- the Norton edition is superb as is the Oxford World Classics edition. Admittedly I don't have the other two for comparison. I have many many others, however, and I enjoy the Norton for its 'critical goodies.' It is also the only book I own in which I write- I am slowly trying to overcome a horror of writing in books. This one already had writing in it, so I feel less terrible about jotting down notes. I am not in a position to review the other Bronte novels in this way, as much as I would like to. If anyone else wishes to do so, let me know if you would like to write a post. Otherwise you might have to wait until I can ransack the university library. Too Bronte, not Bronte enough! What [sweet] madness is this? This year has been ridiculous for reviews criticising films and plays for being too Bronte or not Bronte enough, when in fact the Brontes have nothing at all to do with it. (for much and more raillery besides, drop by Austenblog). The list goes on and on… Previously on Bronteana I responded to claims that Memoirs of a Geisha was like Jane Eyre, and now the new Andrew Lloyd Webber musical 'Woman in White' has been railled against for not being Bronte enough. Duncan Campbell Scott,1862-1947, was born in Ottawa, Ontario Canada. He was educated in various schools in Ontario and Quebec and at Stanstead College, Quebec. He was a civil servant in the department of Indian affairs (1879-1932). He became a clerk at the age of seventeen. He was Deputy Superintendent from 1913, until 1923, when he became Deputy Superintendent General for the Federal Government. His responsibilities included representing the Federal Government in intergovernmental negotiations with the aboriginal peoples in landholding agreements and establishing treaty settlements. Duncan Campbell Scott was also a Canadian author of poetry and fiction, and published many volumes of each, he along with Archibald Lampman, Sir Charles G.D. Roberts and Bliss Carman, is considered one of the Confederation Poets. At the age of 31 Scott began publication with “The Magic House and Other Poems” in 1893 also “New World Lyrics and Ballads” in 1905, “The Green Cloister” in 1935. Much of his discussion revolves around Scott’s sympathetic Poetic treatment of Native Culture versus the severe policies of the department he headed. Many of his narrative poems, such as “The forsaken,” deal with Native American life. Scott is also known for his devotion to the career of his friend, Archibald Lampman. Scott was involved in the publication of several of Lampman’s books. He also wrote short stories. He also loved Emily Bronte. I PROPOSE TO ASK THE READER to visit, with two wanderers, a few of the places that interested them, where the associations are with spirits that can never die, with minds that are as vital as life itself. The sense of obligation lends to these scenes the desire to acknowledge a debt that can never be paid. Let those who come to Haworth, the home of the Brontes, come to it through sunshine. Let them leave the plain of East Yorkshire from magnificent York and go toward the higher plateau at Harrowgate. If the gods are kind to them they will have brilliant sunshine and be reminded of the clarity of Canadian skies and the rolling, unconfined fields of North Sasketchewan where the wheat is ripening. At Knaresborough they will find nothing to remind them of the West. Over the deep glen through which the river Nidd flows, dark and silent, under the ruins of John of Gaunt’s Castle a change has come into the sunlight. It may be just as bright but it falls on a landscape which takes its interest from associations that crowd out any thought of a country innocent of events greater than sowing and reaping. One is prone to think of Haworth as always in shadow and mist, the very center of storm. The accent of much of the Bronte literature is on that aspect of nature. Even on this day in August the clouds press down on the moors and the vista is diminished to a glimpse of Keighley through mist and its own smoke. These two visitors come to the home of Emily Bronte; others may think of the three sisters and pay due homage; to us Emily alone is the source of the faithful wonder and admiration which leads us to her shrine. I cannot refrain from comparing this dour landscape with the little, gentle space of earth that Emily Dickinson looked upon in 1848, the year of Emily Bronte’s death. There the fruitful fields of Massachusetts were outspread holding the village of Amherst, and at the center of Amherst life was the spacious dwelling of the Dickinsons. It was planned on the generous New England scale and today it maintains that tradition of dignity in domestic architecture. Around the house was an intimate garden, farther away were fields which could give Emily the feeling of an estate, and the countryside was familiar to her. But when she was in the early power of understanding and interpreting the larger scene, the world was drawn close about her by her own will; her outlook was restricted to the trees, the paths and the flowers of this garden. In 1870 she could reply to an invitation by the refusal absolute, “I do not cross my father’s ground to any house or town.” In Massachusetts violent storms break and there is deep cold and heavy snow; the reader traces these changes in Emily Dickinson’s letters and poems; they play only a small part in the general fruitful serenity of the State. In 1886, the year of her death Amherst could still be called a ‘village’ and the farms came to its margin. When I visited it in 1929 and 1930, forty-three years had made it more than a town. The house and garden had not changed; flowers from this soil and these trees had been companions, one source of her deepest thought on life and nature. I recalled her admiration of Emily Bronte, ‘magnificent’ among all the modern writers she was familiar with, and remembered the words of that immortal poem of hers read by Col. Higginson at the funeral. Both my visits to Amherst were made in the full sunshine of July and September, and in the summer there was a vireo hidden in the garden preaching to a heedless congregation of leaves. How then could I refrain from comparison between that light and song with this shadow that is soundless. The rest of the work can be read here: Circle of Affection and Other Pieces in Prose and Verse. It is too late for me, at any rate, but perhaps it will be useful to those like myself who are desperately seeking study of the Brontës. The University of Dalhousie in Halifax, Nova Scotia are running a graduate seminar this year (2005-2006) called Brontë Disseminations. If only I did not have to stay here this last year… this would have suited me exactly! But it was not to be. Still, it looks like this university's English department has more Brontë study than anywhere else in Canada. Be sure that I will be applying there shortly! There is so little on the Brontë front in Canada that I really must leave that there. However, I admit that it seems appropriate to me that it is Halifax that seems to be the hub of Brontë studies. I believe in coincidence. I will take the liberty of telling this digressive story because it illustrates the very real aspect of the coincidence quite nicely and in a vaguely Janian manner, coincidences being one of the major 'flaws' of the text, and this story being all about finding cousins in incredible circumstances. Several years ago, I began some serious research into my family history. I traced one branch back to Nova Scotia, where they were settled by the British government in the 1750s. They arrived first in Halifax, then went on to found the city of Lunenburg nearby. They are by no means numerous or famous, just one of many old families. And so, I went to Nova Scotia in order to gain more information and to see some of the places connected with them. I had never set foot in the province before, and knew no one but my mother demanded that I find actual relatives and not only graves and names on paper. No problem, right? One week, in a strange land? Of course I can find relatives. I ignored the imperative and went on with my studies. At the provincial archives, on the first visit, I met someone in the elevator. She later helped me figure out their catalogues. When she heard that the name I was researching was Boutilier she told me that a book was just published on local families, including mine and moreover that the book signing was the following day, and she gave me directions to someone's house. So, we turned off the highway and up a long gravel road running into dense forest. We didn't get far before a couple leaped out of the forest and stopped our car. "Oh, we thought you were someone else" they said. It was the place, though. We walked over but no one came to the door. "Hello!" I shouted. A voice from the other end of the house told us to come in. I walked into the livingroom and saw an elderly woman sitting on a sofa, drinking tea- a guest for the book signing. She looked up and smiled at me. "Hello," I said. "I'm a Boutilier." "So am I." She said. She proved it in the course of our talk by referring to my great great great grandparents Serena Charlotte and William as 'Aunt 'Rena and uncle Billy'. To make a longer story shorter, we travelled on to Lunenburg where I saw the church where my ancestors were married in 1760 (my friends tease me because it is called St.John's…). When I saw it, the most recent renovations were from the 1850s I believe. Within two months it was burned to the ground by arsonists. What do you get for the Brontë enthusiast who has everything? How about a reconstituted marble or bronze resin portrait medallion of Charlotte Brontë? Got a little off topic there. I also bring to your attention this lovely CD with music from The Brontës ballet! You can order it directly from this link! 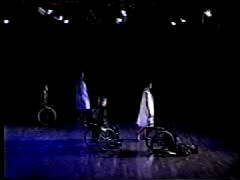 Two standing female dancers dressed in white nightgowns stand on the backs of the wheelchairs of two dancers dressed in evening coats. They move slowly, naturally and quietly around each other in the space. There are many leans and lovely lines made with the chair dancers and the two ladies in nightgowns. Pastoral feel. A video clip is available for viewing and downloading here. (I believe you can save it by right clicking this link). The clip shows not four but five dancers. There are about three main movement sequences, all of which are very interesting to consider. Modern dance is one of the most poetic and ambiguous media we have today- and often the most deeply layered. These are merely my first impressions on the work. The music- from which the ‘pastoral feel’ comes is mostly a soundtrack of birdsong. In the first movement, the ‘two ladies in nightgowns’ (who might encourage comparisons with Jane and Bertha although not necessarily), climb onto the top of the wheelchairs of two men- to rest nearly on their heads. The pose is abruptly dropped- one of the women moves away briefly before returning. Her partner leans forward, resting his head into her lap. The other woman, meanwhile, has knocked over her partner’s wheelchair and is dragging it (and him) across the stage, from a crawling position. This sequence ends with the first woman leaving once more, and the second woman laying down near her partner’s head. The third dancer arrives. 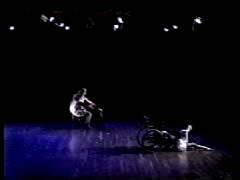 The third dancer pairs up with the 2nd woman, and all move backwards in symetrical formation to recreate poses similar to the first movement, only this time with the ladies leaning together away from and dancers in wheelchairs leaning towards the fallen partner who has stopped moving entirely. At this point intrumental music comes in- a slow woodwind. For the last moment of the clip, the ladies drop to the stage and all turn to face the fallen partner. There’s still nearly half an hour of the dance still to go- I cannot imagine how it would play out, and what it all means. There is no news on the piece being performed recently, but perhaps news of it will turn up and then we can take a better look! This is not the only Brontean dance piece; there has also been a ballet about the lives of the Brontes (a post about which is coming up shortly).